Yesterday evening, Innovation went Heroic Foundry, and our first target was Gruul. Smashing, ceiling-collapsing, petrifying Gruul. And after a long night of running around, on attempt 15, we did the sacrifice-our-bear-tank-as-often-as-possible-strategy, and he went down. Yes, yes, the healer-rotation also worked. Now, I wanted to analyse my performance that night. And I normally did that with warcraftlogs, but last night I used the more graphical enhanced tool from Mr. Robot. I needed Microsoft Silverlight for that, and a upload-program. Which was installed fast. I was actually running it during the raid, which meant I could look at the results after each wipe. That's more for Raidleaders I guess. To look at my own performance I need a little bit more time, although I now know where to look. Let's look at some screenshots I took from the logs. The above picture gives a quick rundown of the actual kill. There are 6 buttons, with some colors around it. Now, Mr. Robot compares the numbers of your raid with all the other numbers they have. Now the DPS seems low, but that may have to do with other factors than only our performance. 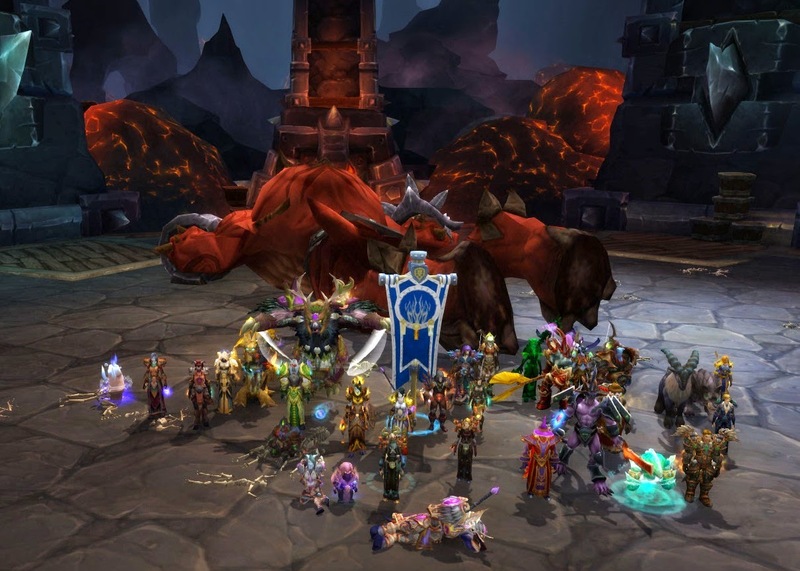 If we are compared with Mythic Guilds who ran HC last week, our numbers will be lower. You also get a direct rundown on how the raid did with damaging abilities. We did well on Avoidable damage, which should make our healers happy, our potion usage..well... under that line is an interesting line, especially considering Innovation killed Gruul on the 15th attempt.... although we had at least two 90%+ wipes, as in accidental pulls. (Yes, it says 9th attempt, but the first 5 are in another log, I was experimenting). This picture is more personalized, it does what it says. 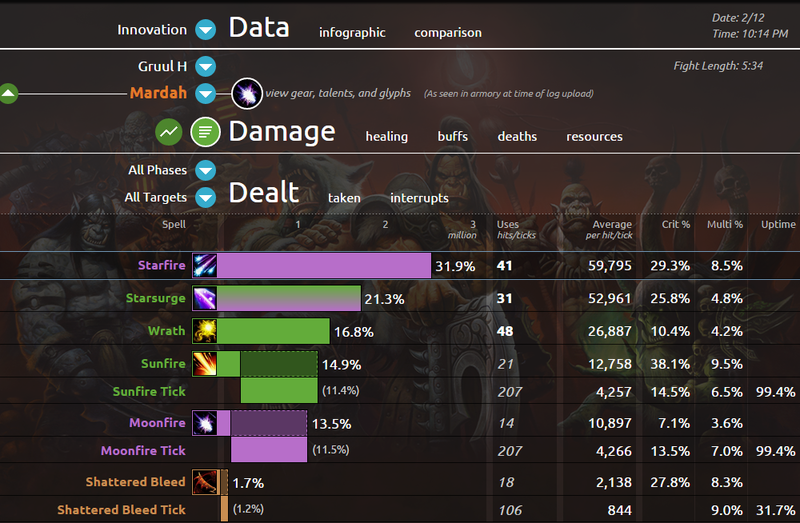 What is your DPS compared to all the other Balance Druids (for me) that we can find on Mr. Robot. This time taking in account Ilvl though.. which makes me sad. Looking at earlier attempts, I saw myself Hovering around 75%, but I had a petrify less on me, and some luck with crits it seem...and I still had a 655-weapon during the kill, not after that though. So, I dived a little bit more into the numbers, and here I find the two things I 'dislike/miss' so far. I would like to know what my performance was before a wipe is called. In the logs from the wipes I would like to exclude the part of the fight after a wipe is called. Our 6th attempt had a badly Inferno-slice at 3:10. I would like to know how I performed up to that, especially because I jumped into avoidable damage after that to speed up the wipe. The second one I found when I looked at my Starfires. 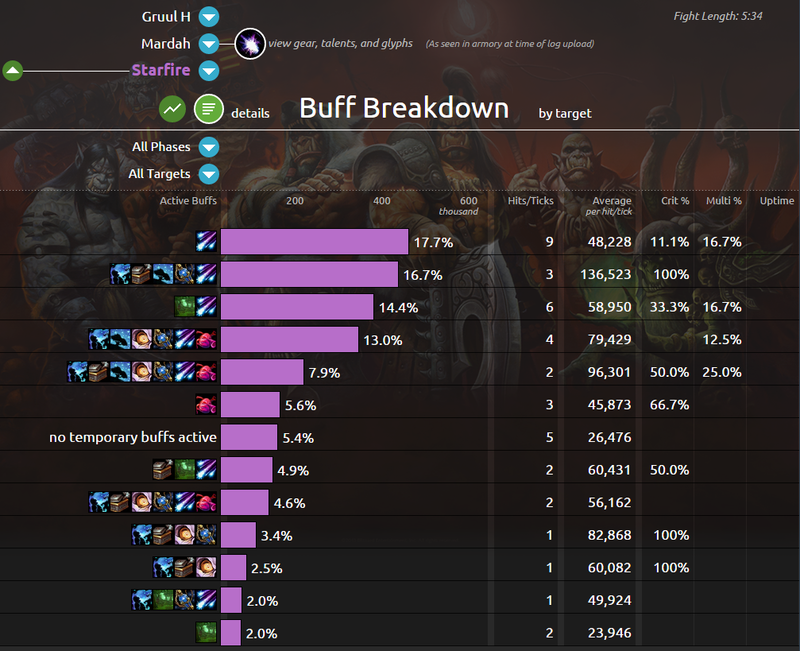 As you can see above you get this nice graph with the buffs various Starfires had. However, you cannot see if I was in Lunar or in Solar at the time of the cast. I know for sure I had some casts end up in the wrong cycle, that is not that bad if they are empowered, but an unempowered Starfire in Solar, yeah, I like to know how often that happened.